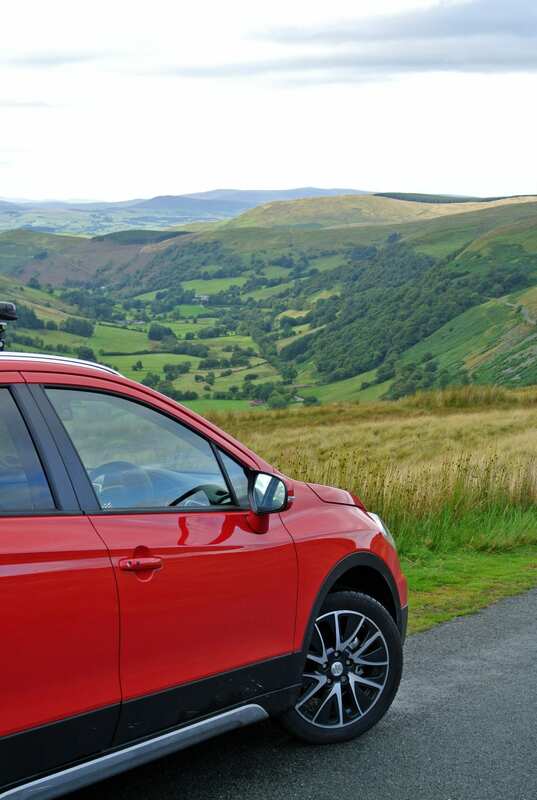 Concluding his week-long busman’s holiday, Iain Robertson drove an amazing 3,000 miles around the UK in pursuit of some of the most spectacular driving routes, to create a travelogue of moderate merit. Crossing the new Menai Bridge to Anglesey provides proof that local authority spending has been made in the right areas. Access to the island is no longer painfully slow during peak holiday season and the recently improved dual carriageway to the ferry port at Holyhead is excellent. Yet, about three miles off the main A55 is the beautiful racing circuit of Trac Mon, at Ty Croes, on the island‘s south-western coast. Developed on a former defence site, its location, topography and views create an uniquely appealing venue. 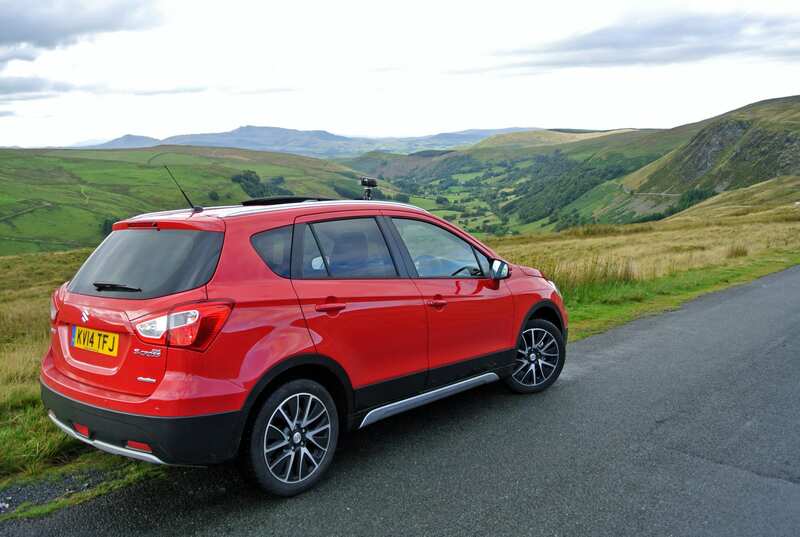 While the Suzuki S-Cross is hardly a racing car, having gained permission to carry out a few flying laps, I was immensely satisfied that its grip levels are excellent and that its on-the-limit handling is tidy and uncomplicated. The circuit offers competitors some very fast sections of smooth tarmac, with some intriguing blind bends (over crests), challenging corners and several changes of altitude over its length. Aided by friendly support staff and plenty of viewing opportunities, Trac Mon is a real gem. After visiting Llanfairpwllgwyngyllgogerychwyrndrobwllllantysiliogogogoch, which was an opportunity not to be missed, while on Anglesey, I headed the S-Cross over the original Menai Bridge back onto the mainland for the drive over Snowdonia. As with Ben Nevis, in Scotland, poor weather set-in, which made summit spotting all but impossible. Again, I was grateful for the surefooted progress allowed by the car along the tortuous route to the mountains. At Llanberis, visitors can catch a train that transports them almost to the very peak of Mount Snowdon. Across the lake from the station is North Wales latest outdoor adventure sports venue, where visitors can literally hurtle, with gravity’s help, from halfway up a mountain, narrowly missing a slate quarry’s peaks, to a base camp on tautly suspended wire-ropes. 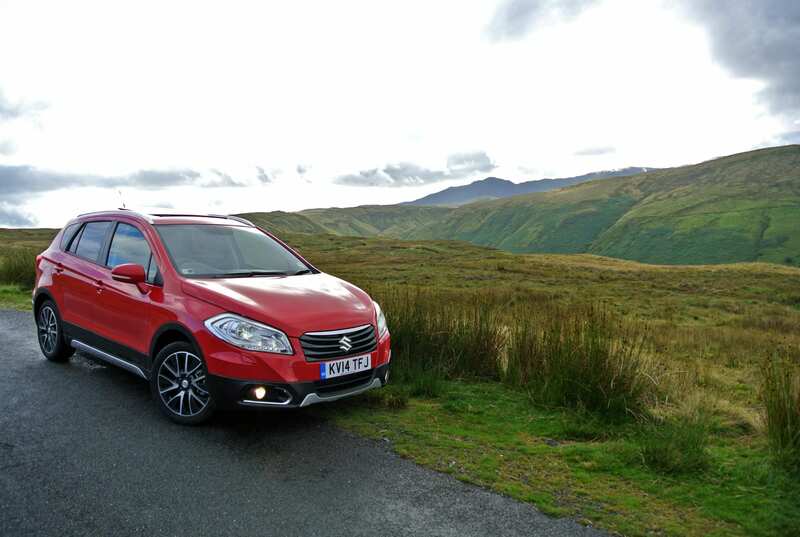 However, the drive up Snowdonia is equally spectacular and the views from the roadway are truly splendid across these slate-covered hills and valleys. You do need to watch out for the combination of walkers, cyclists, motorcyclists and tourist cars, vans, coaches and local traffic. They are unrelenting in their flow and punctuated by mad bursts of open motorbike exhausts, as their riders risk several, often unrealistic, overtaking opportunities. After trying to spot Snowdon’s peak, the combination of sun and rain clouds tempting the viewer with peekaboo irregularity, I decided that continuing the drive south to picturesque Dolgellau was less time-wasting. The roads in North Wales are wonderful, occasionally quite open, but often twisting sinuously around geographical features. It is similar to but quite different from those routes around the Lakes, northern England, or the Scottish Highlands. After a lunch stop in historic Dolgellau, I headed into the Cambrian Mountains to Dinas Mawddwy, on the A470, to find the small turning off the main road for the Hellfire Pass, which, at 1,788ft involves one of the region’s steepest climbs to its summit. It was an excellent diversion, as the views from the peak, after completing the leafy and attractive drive upwards, were totally inspirational. From here, the drive to stay overnight with friends in Stourport-on-Severn was engagingly lengthy but something of an anti-climax. Next morning, I set out for The Cotswolds, an area predominated by its honey-coloured stone buildings, picture-postcard locations and marvellous photographic opportunities. From the ‘South Midlands’ to the M4 corridor, it is an area of outstanding English beauty, whether tackling the inevitable tourist haunts, or finding thatched village gems off the beaten track. The first-class wieldiness of the Suzuki’s handling comes to the fore in this environment, while splashing through fords, or narrow lanes, only serves to test its character even further. My final destination was Southampton but not until I had experienced a drive across the Salisbury Plains, accessing the best public routes from just north of the town of Tidworth, which is undergoing a major transformation to be turned into the British Army’s largest and busiest garrison. After all, the Suzuki S-Cross, from the ‘crossover’ class of family car, is supposed to be able to handle these changing conditions with ease. Although the nearby New Forest offered some appeal, public access across its woodland is restricted. Therefore, after undertaking some fast passes along some well-surfaced range gravel roads, as well as trying the more challenging areas where military tanks have been tested, I was able to declare myself satisfied with the off-road competence, resilience and sheer toughness of the Suzuki. Yet, I discovered a small section of woodland, which did not have ‘Access Restricted’ signs posted everywhere. Driving through the canopy of the trees, on a carpet of age-old leaves, with sunlight peeking through in some areas and distant views across the rolling countryside just possible past the tree trunks, I navigated a circuitous route around the wooded area. It was magical and surprisingly relaxing. Stopping for a pub lunch in Tidworth, mein host outlined the implications of the massive house-building projects and the developments of the Tidworth Camp, as he already enjoyed the nocturnal and weekend social patronage of many of the resident soldiers. Yet, he was aware that innumerable townsfolk were not so welcoming of the massive changes taking place. Reaching Southampton and the end of the high-spots and fast-tracks journey, after just five nights of a driving vacation, the Suzuki had proved its point as an excellent companion. Its on-board sat-nav worked in an exemplary manner, guiding me from one destination to the next without error, while its driver’s seat provided exemplary support for my spine and a vital high ‘hip-point’ for access to the cockpit. The car’s performance from its 120bhp 1.6-lite petrol engine was more than adequate, capable of topping 95mph on a racing circuit, cruising all day long on motorways, or main roads, in a relaxing manner, while being able to power across broken surfaces and gravel tracks with equal confidence. Its handling was direct and responsive, ideal for all the back-doubles, according to driver needs, while the ride comfort was smooth and progressive. Its fuel economy was not too tragic either, returning in excess of 41mpg for the entire trip, which was most testing at times. The bottom-line is that most drivers complain on a daily basis about difficult driving conditions, backed-up traffic on main roads and gridlocked town centres. Yet, to cover 3,000 miles in a week, during the peak of the British holiday season, at a time when a great many British people are also enjoying ‘staycations’, rather than venturing abroad, and not be held up, or delayed, anywhere, was a revelation. It was a most enjoyable, if slightly tiring exercise, putting a great Suzuki car onto the map of a truly Great Britain.